To raise the remaining $1.9 million needed to pay for the already-completed construction costs of the Spatz Theatre, the Citadel High Legacy Campaign is offering the community a chance to make their mark on a theatre seat – literally. 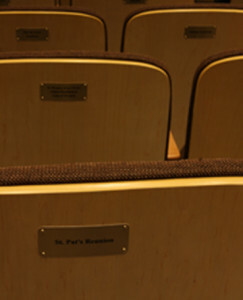 Each of the remaining 536 seats in the theatre can be sponsored and dedicated for a donation of just $1,000 per seat. Businesses, groups and individuals can sponsor one or more seats and have names of their choosing engraved on an affixed dedication plaque. Whether honouring a loved one, a company, group or designated cause, there are many ways that you can make your mark on the Spatz Theatre and create your own permanent legacy.